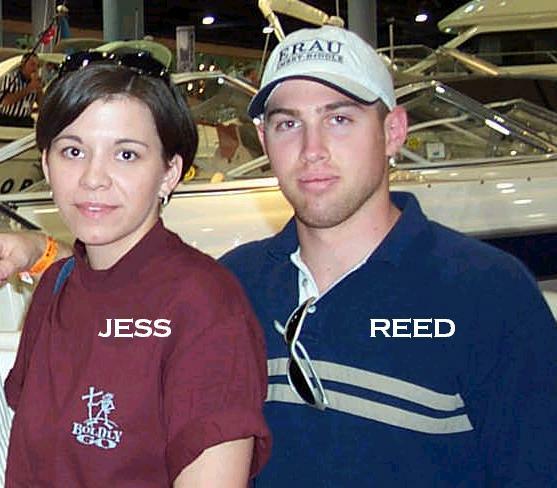 Born on a crisp Sunday afternoon in Vero Beach, Florida, Reed came into this world. He would be the second son of his proud parents, Mike and Elaine. Everyone was there...aunts, uncles, cousins, grandparents, friends, doctors, nurses, patients, outpatients, employees, volunteers, children, their toys as they waited to be checked out by doctors, plants, animals (I'm sure were somewhere on the premises), germs, bacteria...ahhh, everyone came to see the newborn Reed. It was at that very moment that Mike and Elaine decided not to have another child. Yes, Reed had every opportunity a young child could have. A nice warm home, parents that fed him (if you know him well...they could never feed him enough), and a brother that would occasionally beat the crap out of him. Ah yes, the perfect family. Yet somehow, Reed grew into his own image. Actually, he couldn't think for himself at all. So he looked to his family for help. He adopted his father's and mother's musical ability, his brother's surfing interests, and the Miami family's ability to speak their minds. Well, if it was not them, it could have been exposure to the Bob and Tom show (Weekday mornings from 6:00 to 10:00 Eastern time). So where were we? Ah yes, school. Well for those of you planning on attending Embry-Riddle Aeronautical University some time soon, and planning on majoring in Aerospace Engineering, let me offer this one, simple piece of advice...STAY OUT OF ICE!!! IT WILL RUIN YOU!!! THE PROFESSORS DON'T CARE ABOUT YOU!!! IT'S ONLY ABOUT THEIR ICE PROGRAM!!! GET OUT WHILE YOU STILL CAN!!! GET OUT! GET OUT! GET OUT! So anyways (stay out of ICE! ), Reed has many high hopes and dreams for the near and far future. Unfortunately, not everyone can be Bill Gates Rich and have a back yard the size of Wyoming. But who can judge? Who wants to ruin this poor man's hopes and dreams? Well this is Reed's bio page. I would like to thank all of you who made this possible. I apologize to those whom I have insulted or even feel insulted from reading this web page (Reed will not take it personally).